With the power of PhotoVidShow you can now show off your pictures and videos on TV in the comfort of your own living room. PhotoVidShow is a tool that allows you to burn a CD/DVD containing pictures that will play on a normal DVD player. Once you've created your masterpiece, simply insert the disk into a normal DVD player and your photos will be spectacularly displayed on TV as a "Photo Video Slideshow". PhotoVidShow offers you more than the normal static one after the other type slideshow, instead it offers fantastic features including panning and zooming, background music, overlay text, professional-looking transition effects and multiple slideshow support with stylish menus. But what is panning and zooming? (also know as Ken Burns effects). We've all see it on documentary type programs on TV. When the TV maker wishes to display a picture or photo, instead of a normal static "life-less" image, you'll notice that it will slowly move and zoom around it bringing it to life. With PhotoVidShow this facility is provided automatically when importing images. Also to give fine tuning, PhotoVidShow allows you to edit the pan and zoom regions as well. 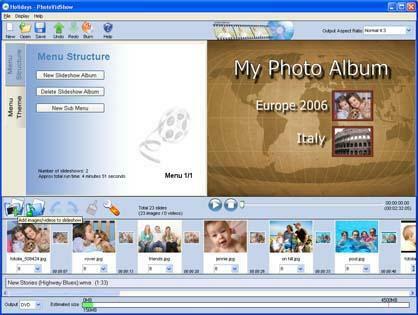 PhotoVidShow has the ability to import video files as well. Most modern digital cameras now have the ability to take small video clips, but how are you going to print them off to share with your friends? PhotoVidShow not only allows you to import videos, but you can also seamlessly import them in with slideshows that already contain pictures. So you can now show off your complete film in the same slideshow! With the easiest to use yet editor and with a powerful preview facility, you'll soon be creating stunning slideshows in just a few clicks.